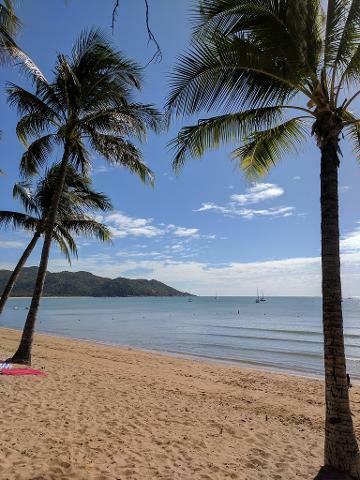 To depart on our "Island Sunday Afternoon" tour you will need to catch the Sealink ferry that leaves Townsville at 9.30 pm; or the Fantasea service leaving at 9 am. We leave from the Island ferry terminal at 10.05 am and will get you back to the ferry terminal at 2.50 pm, in time for you to catch the 3 pm Sealink or 3.30pm FantaSea ferry back to Townsville. A mature and highly-regarded local guide will provide friendly, entertaining commentary on hundreds of topics covering birds and wildlife, trees, geology, marine creatures, history and folklore as you tour the scenic roads and byways. From around 1 pm we provide guests with approx an hour's free time at the most popular spot on the Island, beautiful Horseshoe Bay, where food, drink and ice cream are available from a selection of good eateries.